Cloud-deployed property management platform Buildium is designed to give property manager absolute control over their businesses and operations. Association and residential managers can use the software to improve vacancy, rental and maintenance cycles. Also, the solution makes it easier to receive rents and automatically notifies when payments are due or late. Being a cloud-based system, it does not require any additional hardware or software installation and can easily be accessed from anywhere using a browser. Property managers often find themselves overwhelmed with the workload as their job isn’t just about collecting rents. The software takes cares of the hard work and allows managers to focus more on new business opportunities instead of spending all their time on routine operational work. The time and money saving features of Buildium allow property managers to manage more rental units and provides them with all the tools required to grow their business. Options including creation of custom rental applications, background and credit checks, rent collection and reporting make the job a lot easier and increase overall productivity. The software automatically handles operations such as vacancy advertisement, payment tracking and acceptance of maintenance requests and provides all the necessary tools to minimize late payments. It allows tenants to access their information online and help collect the payments electronically, which also saves property managers from calling the tenants repeatedly. Buildium’s DIY tools allow managers to create marketing websites that serve as a tool to list their properties and effectively communicate with the owners and tenants. These marketing websites can be customized using custom images, logos and more and also be used to accept online rental applications. The software makes it very easy to track leases, which take up most of the time of property managers. The online dashboard provides all the vital information managers need and gives a quick overview of the leases about to expire in near future. Automatic reminders are sent before expiry of a lease, which helps in timely follow up. The one-stop property management software helps track agreements and allows both the owners and property managers to generate detailed reports. The reporting tools provide a bird’s eye view of all the properties and help effectively monitor status of payments. Tenants can see their payment history and generate detailed reports of previous payments. Tenant portals also allow tenants to make electronic payments and track maintenance requests, saving a lot of time and effort. If you are considering Buildium it could also be sensible to investigate other subcategories of Best Hotel Management Software listed in our base of B2B software reviews. Every enterprise has its own characteristics, and might call for a special Hotel Management Software solution that will be adjusted to their company size, type of customers and employees and even individual industry they deal with. You should not count on getting an ideal solution that will work for every business regardless of their background is. It may be a good idea to read a few Buildium reviews first and even then you should pay attention to what the software is supposed to do for your business and your employees. Do you need a simple and straightforward app with just essential functions? Will you really use the complex functionalities needed by experts and large enterprises? Are there any particular tools that are especially useful for the industry you work in? If you ask yourself these questions it will be much easier to get a trustworthy app that will fit your budget. We realize that when you make a decision to buy Hotel Management Software it’s important not only to see how experts evaluate it in their reviews, but also to find out if the real people and companies that buy it are actually satisfied with the product. That’s why we’ve created our behavior-based Customer Satisfaction Algorithm™ that gathers customer reviews, comments and Buildium reviews across a wide range of social media sites. The data is then presented in an easy to digest form showing how many people had positive and negative experience with Buildium. With that information at hand you should be equipped to make an informed buying decision that you won’t regret. What are Buildium pricing details? What integrations are available for Buildium? Buldium allows you to export data to Outlook using Excel as an intermediary. Pros: I have switched from Buildium to Appfolio and then again to Buildium. It is intuitive and easy to use software. The software is constantly updated and it has lot of new features. The feature I like most is the easinessof sending reports to the owners and paying them for the work. Cons: It would be really helpful if there is an option to customize fields in a report instead of using those stock reports. It would be nice if the background checks have rental history. 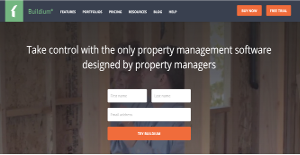 Pros: Buildium is one of the easiest tool when it comes to property management software. The setup of a new property and procuring tenants is easy to do. It offers advertising, so we can better develop from a few properties to almost 50. Cons: What I don’t like is how accounts got credited when the tenant pays the rent. For e.g. I work for someone and we make partial payments every month because he needs to pay more of a security deposit. The fact that money is owed, if it is represented as a negative balance then the software automatically pays accounts that have the negatives. But thankfully, this one can be changed. If you need more information about Buildium or you simply have a question let us know what you need and we’ll forward your request directly to the vendor.